Here’s a For the Birds column I wrote a few years ago. Seems appropriate with a cold, gusty wind blowing today. Photo by Chris Bosak An American Tree Sparrow perches near a feeding station during the snowstorm of Feb. 13, 2014. One of my favorite times to watch birds is when the snow is falling. Not a driving snow with icy temperatures and high winds, but an otherwise rather pleasant day with frozen crystals falling from the sky and covering everything with a fresh coat of white. I do not shy away from taking walks to look for birds when the snow is actively falling, in fact I thoroughly enjoy walks at such times. But I also enjoy very much watching the activity at the feeders during snowfalls. As long as the snow is not falling at too fast a rate, the birds will continue coming to feeders. Indeed, during light and moderate snowfalls the birds may be seen at higher-than-usual numbers at backyard feeders. I will often grab my camera, open a window, pull up a seat and capture images of the hungry birds as snow falls and collects around them. I could do that for hours. Heating bills be damned. The usual suspects such as Northern Cardinals, Downy Woodpeckers, Black-capped Chickadees, Tufted Titmice and White-breasted Nuthatches are typically seen in high numbers during snowfalls. It’s also a great time to see birds such as Carolina Wrens and Dark-eyed Juncos. But what about when it’s a heavy snowfall? I mean, right in the middle of the worst of it? Birds are scarce then. Wouldn’t you be, too? Where are the birds then? Most humans are holed up at home or work or some other place of shelter. Birds do pretty much the same thing. Whether their shelter is an evergreen bough, a patch of thick brush, a bird house, an old nest hole in a tree, or even under the snow, birds do their best to stay out of the harsh weather. Depending on the species, they may also huddle together for warmth, often holing up together in a birdhouse. That’s why it’s important to keep your birdhouses up all year and to clean them out after the nesting season. Some birds, such as grouse, will even use the snow to their advantage by burying themselves into the snow for shelter. Those birds are insulated by the snow and out of the elements. The danger with that strategy is sometimes snow will turn to ice and a hard surface may form on the top of the snow. Birds also know beforehand when a storm is coming. Sensing a change in air pressure, the birds build up their fat reserves to use as energy during the storm. That, obviously, makes the time leading up to harsh weather a good time for us to watch feeders, as well. Food, eaten beforehand, is important to birds’ survival of storms. So make sure your feeders are well stocked this winter and offer a variety of foods in different feeders. I’m sure more snow is coming before too long. 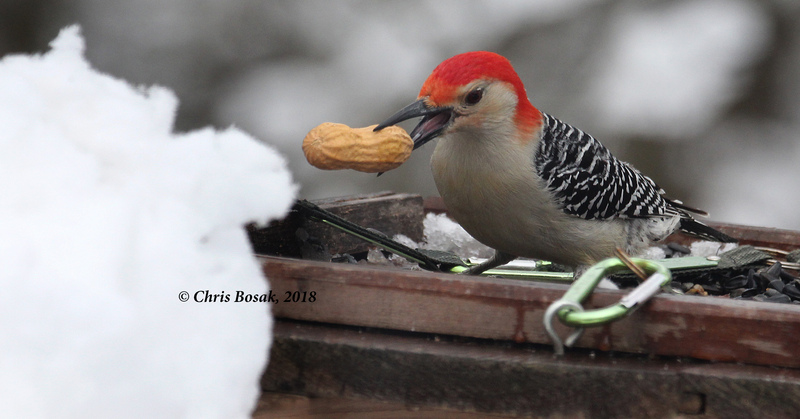 A red-bellied woodpecker grabs a peanut from a feeder, March 2018. Andrew, my 14-year-old going on 21, and I took a walk in the woods together this evening. These walks don’t happen as often as they used to or as much as I’d like, so I was more than happy when he said ‘yes,’ when I asked if he’d like to come along. 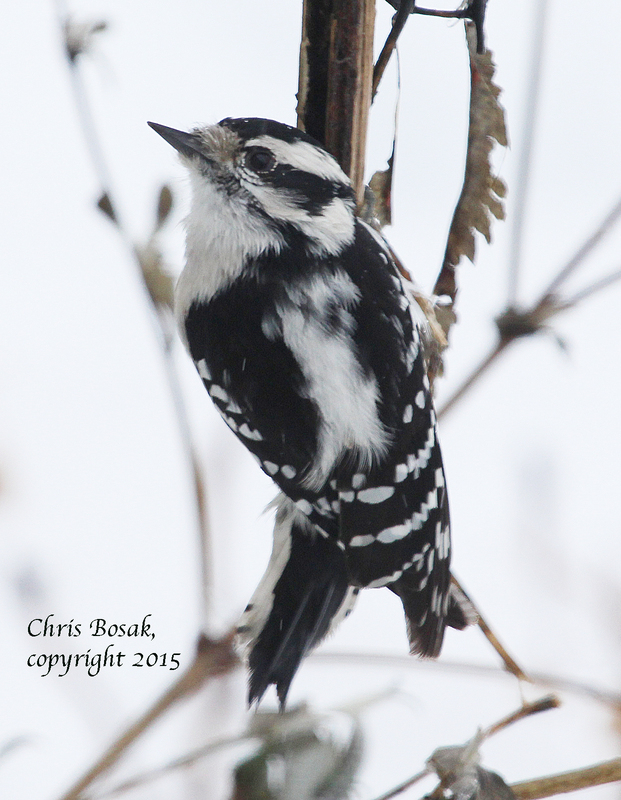 A female Downy Woodpecker perches next to a birdfeeder in New England, Jan. 2015. Yesterday (Saturday) coastal southern New England had its first significant snow of the year. And even so, it wasn’t that much of an event as we woke up to about four inches of snow and nothing else fell during the day (except some light rain off and on). But it was nice to see snow finally (I’m sure not everyone shares that opinion) and, for me, that always means checking out the feeding stations for photos opps. 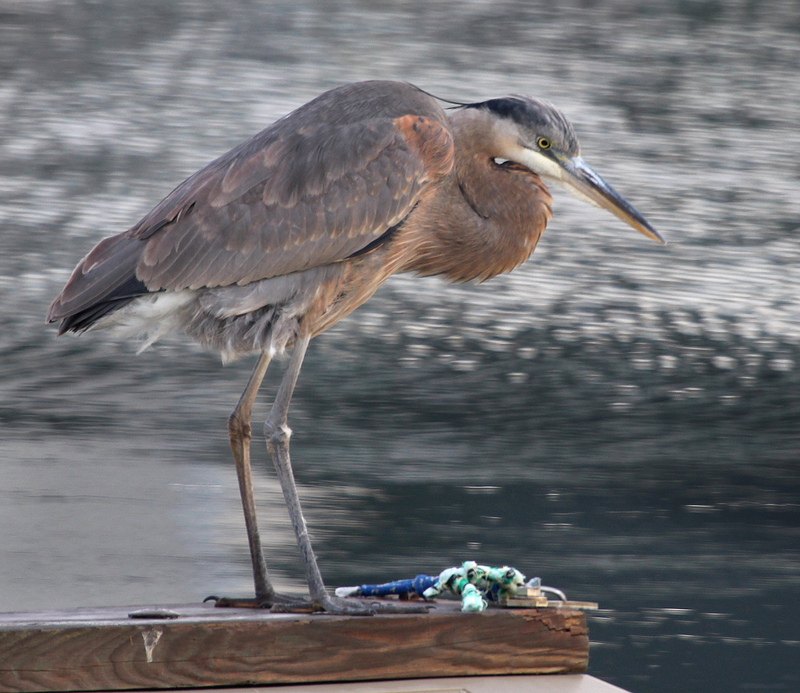 A Great Blue Heron stands on a dock near the Norwalk River on Wednesday, Dec. 17, 2014. Some try to stick out the New England winters and some fly south where it’s warmer. That can be said for several species of birds, but for this posting I’m talking about Great Blue Herons. The pictured bird was found earlier this week near Veterans Park in Norwalk, Conn. Follow www.BirdsofNewEngland.com and receive notifications of new posts by email.